Let’s start with some features that are, without question, worth mentioning and then dive into product details. Elastic APM is GA. Learn more about the product, how to get started with application performance metrics and sign up for the upcoming APM webinar in the release post. A scheduled event is one which is known about beforehand, for example black Friday or an upcoming public holiday. 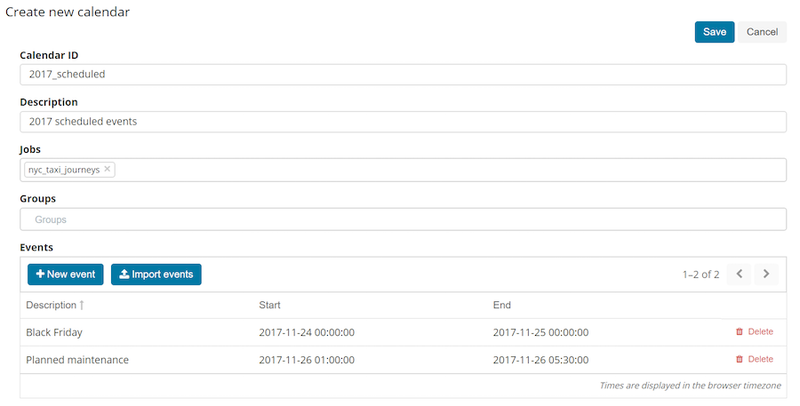 If configured, it is now possible to skip analyzing the data during the scheduled event. This means that anomalies will not be identified during the scheduled event and that the model will not be unnecessarily affected by it. Scheduled events can be configured using a new Settings tab in the Machine Learning UI. These can be added manually or imported from an .ics file. The summary, or aggregation, of features is in the detail post. The Rank Evaluation API is for tracking how rankings of expected results is measured against specific queries. Get access to the Elastic Stack with the introduction of SAML support and make it easier to comprehend with audit log filtering. Sometimes bad things happen, and we’ve added improved safeguards around user searches. Visualize the future of interacting with your data in the detail post because there is MUCH more than can be listed here. A Beats monitoring UI in Kibana? Awesome. 6.2 includes adding support for Vega, a data visualization language. Confused why your pie charts don’t display 100% of results? You’ll love the ‘Other’ and ‘Missing’ terms buckets. Grok the details in the detail post. Passwords in plain text files? Suboptimal. Hide it all away in the Logstash Keystore. The JDBC Static filter is here! Numerous, and significant, improvements to the Persistent Queue. If you want all the details, ‘Go’ read the detail post. The Beats monitor about everything, but did you ever want to monitor the Beats themselves? Now it’s possible with the Beats central monitoring support in X-Pack Basic. The Beats send their health metrics to Elasticsearch, and a custom Kibana app shows you what you need to know. Secrets store. No more storing passwords in plain text, all Beats now have a keystore functionality for keeping their secrets secret. Auditbeat GA. Our latest Beat is ready for prime time. The rough edges were rounded and the feedback has been great. Filebeat Osquery module. Osquery + the Elastic stack is a fantastic combination, and the new Filebeat module makes it super simple to centralize the results collected locally by osqueryd into a centralized Elasticsearch instance. Map your eyes over the all the details in the detail post. New Error Handler API is now in Beta. New built-in policies for handling bulk write failures.